… we challenge you to try them all! Wine and soft drinks also available! We are pleased to announce our running order and show times! Due to demand, we have extended our deadline for entries to our Bake Off by a couple of days! Please get your forms to Carole Moody as soon as possible – and if you can’t get there please email chair@knockholtcarnival.co.uk to book a place! Kno ckstock is back for 2017 in a fresh new venue. Come and join us for the ticket launch event on Saturday 15 April in the Three Horseshoes from 7pm. 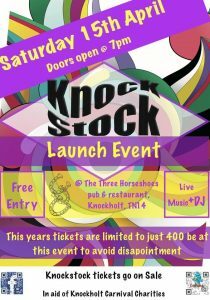 Only 400 tickets for Knockstock are available so make sure you are at the launch to avoid missing out! The festival itself is on 15 July – mark it in your diary now!